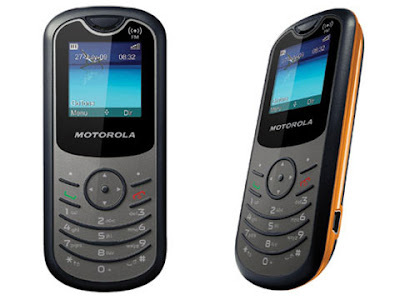 FM mobile, Motorola WX180 has been announced by Motorola for budget-conscious buyers. Motorola MotoYuva WX180 is a simple phone at a price of Rs.1635 and this handset is available in Black colour. MotoYuva Motorola WX180has 128X128 pixels 1.5 inches, CSTN TFT 65K colour display. This candy bar GSM phone is rough and sturdy in design and useful for rough usage. Motorola Motoyuva WX180 measures 106x46x14.5 mm and weighs 65g. The reason for its light weight is its plastic body. Keypad is made in rubber and is quite flexible. At an affordable price, Motorola WX180 has quite impressive features. 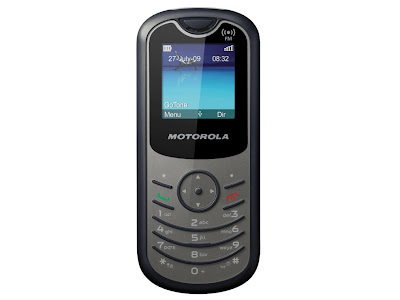 Motorola MOTOYUVA WX180 gives enough battery backup as in talk time of 8 hours. Its standard rechargeable standard Li-ion battery rated at 650 mAh renders 480 hours of standby time. Though WX180 lacks provision for expandable memory but comes with 1 MB of internal storage. One may enter 500 phonebook entries and 140 SMS can be stored. On the other side, MotoYuva WX180 lacks most of the connectivity features like the Bluetooth, GPRS, EDGE and Infrared or any sought of wireless data connection available on the phone. For connectivity and local data transfer, a USB 1.1 port is there in MotoYuva WX180. It may be utilized for wired connectivity in media transfer and charging of the phone battery. The integrated stereo FM Radio with RDS is ideal for music lovers. It let them even record FM radio clips. Hindi language support give benefit to wider customers. Phone also has features as Hinglish Predictive text, wallpapers and Indian ring tones customized especially for Indian customers. WX180 comes pre-loaded with 7 polyphonic ringtones, 2 embedded games viz. F1 and Race Copter. Embedded applications in WX180 are Organizer, Calendar, Currency Converter, Alarm Clock, Stop Watch and Calculator.